La Jolla California - Welcome to La Jolla California! can enjoy daily when visiting the area. and upscale coastal city located in San Diego. Welcome to La Jolla California, one of San Diego's finest coastal communities. Find local La Jolla area hotels, motels, resorts, photos, things to do and local events. and much more at La Jolla Elementary School. live music and artisans showing fine arts and crafts products. in La Jolla or Pacific Beach? and speak to a local La Jolla area expert! some of the hottest boutiques to visit in the La Jolla area. with hotel rooms starting at $139.00 per night! "A view with a room!" Hotel La Jolla offers rooms overlooking La Jolla Shores Beach and is just a short walk from its sandy beaches. Some of our over-sized guest rooms includes a private balcony with patio furniture, minbar, robes, coffee maker and hair dryer. The La Jolla Shores Inn with Hotel Rooms starting at just $83.00 a Night! La Jolla Cove Suites, right in the heart of La Jolla Village, offers full amenities, with the emphasis on personal comfort, relaxation, and best of all: affordable rates. Recent renovation includes a rooftop special events facility with a million dollar view, where a deluxe complimentary continental breakfast is served daily. This is one great place to stay in La Jolla with excellent ocean views. Welcome to La Jolla Village Online.com, your one stop shop for La Jolla California hotels & resorts, shops, vacation rentals in La Jolla, La Jolla area beaches, weather, real estate, homes and condos for sale and more. If you are looking for something in La Jolla San Diego, this is the place! "La Jolla" meaning in Spanish "The Jewel", is a local coastal community in San Diego and is known for great scenic beauty, golf, beaches and some of the finest shops and hotels in Southern California. Check out some of the best restaurants, things to do, places to shop and more here at La Jolla Village Online.com. La Jolla is one of the most upscale neighborhoods in Southern California comparing to the likes of Beverly Hills but with a few less people and a beautiful coastal ocean location. Come and see what makes this "upscale jewel" in Southern California so special! Looking for something to do in La Jolla? Check out Hike, Bike and Kayak for bike rentals, kayak rentals and tours in La Jolla! 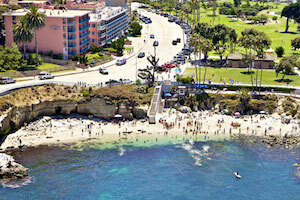 La Jolla Cove is an underwater marine preserve and is an awesome place to snorkel or kayak! raise money for medical treatment to San Diego's area youth who cannot afford it. of local guests and celebritie. Check out the photos below.